Our seasons can run very opposite of one another: hot and humid during the summer months, bitterly cold and dry during the winter months. To achieve year-round comfort that meets the needs of you and your family, you need reliable, dependable and efficient heating and cooling systems. You also need expert help, and the good news is that the pros from Quality Air Heating and Air Conditioning can help you with both. Our experts are NATE-certified and available for 24-hour emergency service should you ever need it. We work with just about every type of heating and cooling system around, and we offer installation, repair, replacement, and maintenance services. Let us help you stay comfortable all year long in Westerville with top notch heating and cooling service- call us today! There’s no doubt that you need a heating system here in Westerville. The questions are, what kind of system are you going to use and who is going to take proper care of it? The good news is that our NATE-certified pros can help you answer these questions and more. Our experts work with a wide variety of heating system types and we offer expert installation, repair, maintenance and replacement services. Have an emergency at an off hour? Just give us a call and we’ll dispatch someone right away. If your heating isn’t working properly in Westerville’s winter you need a company that offers emergency services for fast repair. 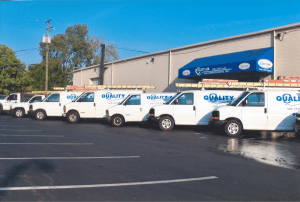 Quality Air Heating and Air Conditioning offers emergency heating services to Westerville, OH and the surrounding area. Our furnace repair services are second to none in the area. Our technicians are highly trained to work with heating systems of different brands and types. We will quickly identify the issue at hand and make the repairs necessary to get you back up and running in no time! Call us right away to schedule heating repair in Westerville, OH and the surrounding area. Your gas or electric furnace is critical to being warm and comfortable during the winter months. When you need help with repair, or it’s time to replace your gas or electric furnace, make sure ours is the number you call. Are you interested in using a heat pump HVAC system in your home? Do you already have one and need to know you are hiring professionals any time you need assistance with repair or maintenance? Then you have come to the right place! Our technicians have years of experience with heat pump systems, allowing us to meet all of your heat pump HVAC needs in Westerville! Experiencing Challenges with Your Indoor Air Quality? Are you or your family members sneezing in fits every time your HVAC system begins a new cycle? Is your air excessively dry or humid? These are indoor air quality issues, and our experts can help you with any indoor air challenge you may have. We have the products and services to make sure your indoor air is at the level you want and need. Indoor air that is too dry or too moist leads to multiple problems for you and your home, but you can easily alleviate issues of humidity imbalance with our help. The experts from Quality Air Heating and Air Conditioning can install, maintain, repair or replace any whole home humidifier or dehumidifier. Let us help you balance the humidity in your home. Clean indoor air isn’t a luxury, it’s a necessity. If you are struggling to have the clean indoor air you need, let us help you with the installation or replacement of a whole home air purifier. Do you already use an air purification system? We can make sure it works optimally with expert repair and maintenance services. During the warm months of the year, Westerville can become a very hot place. Using a whole home air conditioning system is one of the best ways to beat the heat. We can help you find and install a new air conditioning system, or make sure your existing one works great with professional repair and annual maintenance services. Our pros work on just about every type of AC around and all the major brand names. Is It Time for Air Conditioning Repair? There are a lot of tasks around your home that fall into the do-it-yourself category, but air conditioning repair is not one of them. When you need help with your AC, let our experts handle it. We’ve seen everything from refrigerant leaks to broken compressors, so you can rest assured that we’ll repair your air conditioner correctly the first time around. No commercial building can function properly without having a comfortable atmosphere, and much of that atmosphere is dependent on temperature. The NATE-certified pros from Quality Air Heating and Air Conditioning bring many years of commercial heating and cooling experience right to every job we do. What does this mean for you? It means that when you call us for installation, repair, maintenance or replacement, you don’t have to worry one bit because your commercial HVAC system is in great hands. Let us help you with all of your commercial heating and cooling needs in Westerville! Is your commercial HVAC system making strange noises, significantly underperforming or sucking up way more energy than it should? Then it’s time to call the pros at Quality Air Heating and Air Conditioning. We’ll repair your heating and cooling system correctly and efficiently the first time around!